This story is developing. Follow us on Facebook and Twitter @cityonahill for updates. Students vote ‘no’ and deny entry to campus for Joseph Loffredo, husband of Merrill Provost Elizabeth Abrams. Photo by Alex Posis. Source says all six UCSC students who were arrested March 3 are officially being charged with just two misdemeanors each — resisting arrest and causing a public nuisance. Four of the students appeared in court today. All six students are pleading not guilty and will return to court March 17. 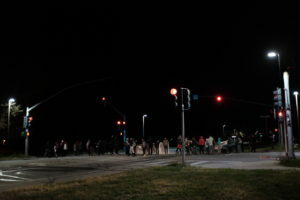 By 5 a.m., the west entrance and the Coolidge and Hagar intersection near the east entrance were blocked by student protesters. The protesters let cars already on campus leave, but prevented any cars from entering campus unless emergency vehicles, doctors, day care providers, researchers with time-sensitive projects or Family Student Housing residents. Public Affairs emails and a CruzAlert were sent advising people not to come to campus. There were a handful of “strike captains” at each entrance, who are student organizers who repeatedly said, “We are not the boss of the picket line, we will all be making decisions together.” The captains were also making any people inside cars attempting to cross the picket line show identification to verify their name and title or department. Under no circumstances were administrators granted access to campus by the protesters. Several student organizers encouraged the student protesters over a megaphone to stand in solidarity with the six students who were arrested March 3, and condemned the university for their two-week interim suspension, potentially endangering their ability to pass classes this quarter. 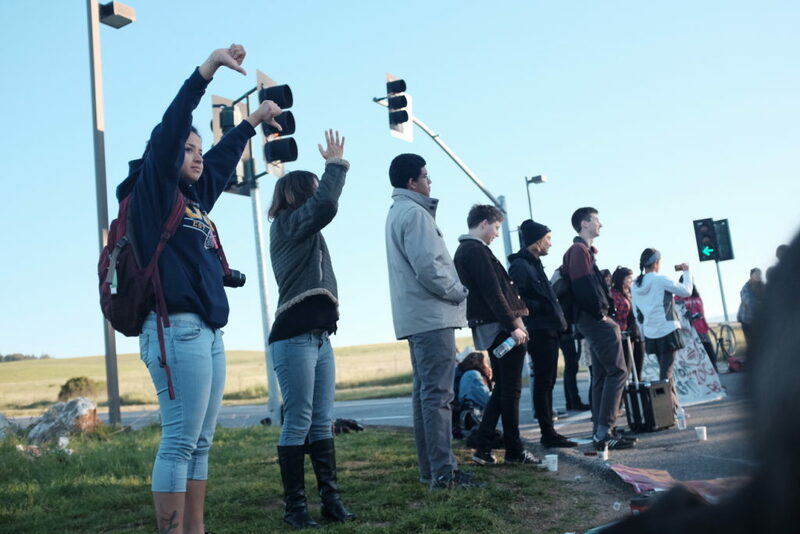 The six UC Santa Cruz students were arrested on one felony charge — conspiracy to execute a crime — and three misdemeanors — creating a public nuisance, failure to obey lawful order and failure to obey executive order from a police officer — for blocking traffic on Highway 17 starting around 9:20 a.m. Four of the students remain in jail. Hagar and Coolidge intersection blocked at 5 a.m. Photo by Alex Posis. 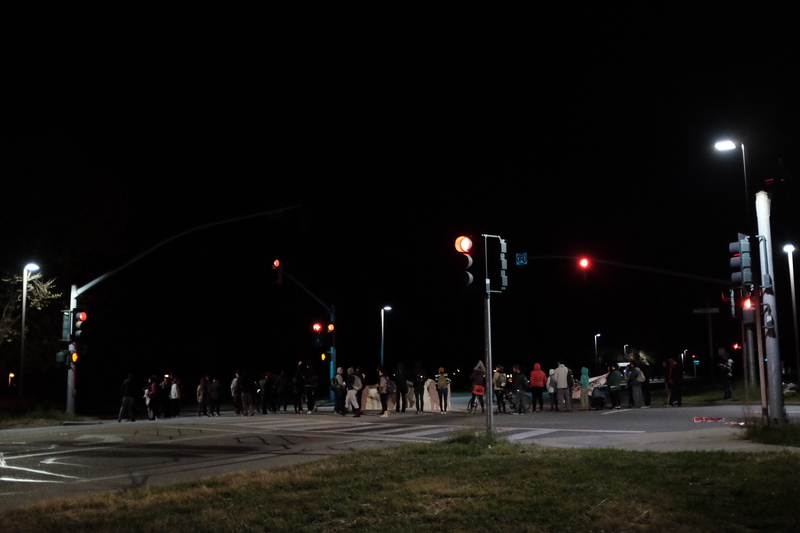 About 90 protesters blocked the west entrance, while about 30 protesters on the east side of campus decided to block the Coolidge and Hagar intersection in a diagonal line across the street because it blocked any car entering from High Street or Bay Street, and also blocked the UC police department and faculty housing. Occasionally faculty would come out of their houses and voice frustration with the students, but the protesters were once met with support from a union worker living in faculty housing who brought out coffee for the protesters. UCSC News and Media Relations Director Scott Hernandez-Jason said before 5 a.m. it was decided that police would be on hand just to ensure the protest remained peaceful, but in no effort to stop the strike.